I just returned from a thirteen hour shift at Barack Obama's Campaign for Change field office in North Berkeley, California. Tomorrow, I'll return for the second of four full days of get out the vote operations. Our (relatively small) call office made over 20,000 calls today to voters in battleground states like Florida, Colorado and Nevada. That alone is pretty remarkable. But what is totally unprecedented is this: the entire office is people powered, fueled by the energy, money and time of hundreds of volunteers. There wasn't a single paid staffer from the Obama Campaign or any other organization in our office today. Every call made, every list printed, and every byte of call data was made, printed and entered by volunteers. 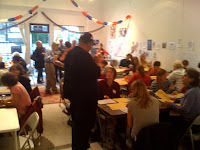 In fact, with the exception of the main room, a bit of paper, a couple of computers, and a dozen old cell phones - which were paid for with campaign funds - the rest of the operation's costs, materials and equipment was provided by volunteers. Hundreds of callers chatted away on their own cell phones and our data team typed away on their own laptops. When our volunteer numbers exceeded our wildest expectations - tripling our previous daily maximum! - we spilled over into a neighboring art studio, general contractor's office upstairs, the (rainy) backyard, and even commandeered a cafe across the street. All of that space was kindly donated by our neighbors. And of course, so much of the campaign funds that covered the rest came in the from of small individual donations from folks like those in our call center. This is people power. It's Democracy in action. And it's why Barack Obama is going to win. If you can't tell, I was floored by my experience today. Whether it was the half a dozen volunteers lined up this morning at 7:00 am to make calls, or the volunteers who happily made calls in the rain outside when things got crowded, and the volunteer GOTV managers, Meredyth and Molly, who kept things running smoothly all day, the energy of today was simply stunning. And our one call center was just one of over five hundred across the country. That's not including the hundreds of ground-team offices in battleground states going door to door until the 4th, rounding up voters and getting them to the polls. I heard today from friends in North Carolina, Alaska, Colorado and Virginia who were pitching in at their local offices. Call centers in California alone made at least 1.5 million calls today to voters. And we'll all keep doing it for three more days. I can't help but think that this incredible outpouring of grassroots, volunteer support has the potential to change the face of American politics. With friends like these - like the hundreds of thousands of volunteers devoting their time and money to helping the Campaign for Change - perhaps Obama won't need the kinds of friends George W. Bush has - Exxon, Enron and evangelical fundamentalists. And I can't see how a President Obama could run a White House as secretive and unresponsive to democratic pressure as the Bush White House. When I talk about my excitement about Barack Obama, some chastise me as putting too much hope in one man. But it's not Barack Obama that gives me hope. It's the hundreds of thousands of dedicated volunteers and millions upon millions of voters who will elect him. It's what that kind of grassroots power means and how it will reshape the political landscape in this nation that gives me hope. I'm not counting on Barack Obama to deliver the kind of change this nation needs all on his own. Putting our faith in one man is foolish, however inspirational that man may be. But the fire I see in the eyes of the volunteers in our call center, and the hope in their hearts is enough to give me faith. It's enough for me to believe that perhaps, at last, we may see the end of the cynicism that has pervaded American politics, depressing voter turnout and grassroots political participation - playing right into the hands of special interests. It's enough for me to hope that we're seeing the restoration of Democracy in America. After all, what is Democracy but People Power. And that's exactly what I saw today. It's not too late for you to go on down to your neighborhood campaign office. No matter which candidate you support - and I honestly mean that, whichever candidate - volunteering to help elect the candidate you support helps tip the balance of Democracy back to the side of We the People. There are three days left until what will no doubt be an historic election. Three days. No regrets.